On Wednesday, the U.S. European Command (EUCOM) revealed the destroyer USS Donald Cook was buzzed repeatedly by Russian Su-24 fighter jets while sailing in the Baltic Sea on April 11 and 12. The jets came as close as 30 feet to the warship; later Russian helicopters also found the Donald Cook and circled it several times at low altitude. “We have deep concerns about the unsafe and unprofessional Russian flight maneuvers. These actions have the potential to unnecessarily escalate tensions between countries, and could result in a miscalculation or accident that could cause serious injury or death,” the EUCOM statement read. This restrained perspective and attention to context is notably lacking in media discourse about the United States and China in the South China Sea. Helene Cooper’s recent article in The New York Times about an encounter between the USS Chancellorsville and a Chinese frigate near the Spratly Islands describes nothing so dramatic or potentially dangerous as the Russian jets that buzzed the Donald Cook. As Cooper clarified in a Facebook Q&A, the Chinese frigate never got closer than three miles to the Chancellorsville, and a Chinese helicopter, unlike the Russians in the Baltic, did not make simulated attack runs on the ship. Also unlike the Russians, the Chinese ship eventually responded to calls over the radio and a professional, if stilted, conversation ensued. Yet the language Cooper used to describe the events gives the impression of a tense, delicate situation that threatened to break out into a clash at any moment. A “threat warning sounded over the ship’s intercom,” the Chinese ship and helicopter’s failure to immediately respond to radio calls was “ominous,” and “the two naval forces [China and the U.S.] are on almost continuous state of alert.” The New York Times’ Editorial Board concluded that “confrontation [between the U.S. and China] seems increasingly likely” that same week. Some might argue the difference in treatment is because the strategic situation in the South China Sea is more tense than the Baltic. But in the past eight years Russia has intervened militarily in three sovereign countries: Georgia, Ukraine, and Syria. By contrast, China has occupied and built up several uninhabited atolls and harassed a lot of fishermen. This is not to minimize the seriousness of China’s extensive activity in the South China Sea and the major implications it has for other countries in the region. But it’s difficult to make the case that Chinese behavior is more worrisome or escalatory than Russia’s. In fact, General Dunford, the chairman of the Joint Chiefs of Staff, called Russia’s actions “alarming” and said Moscow — not Beijing — was the greatest military threat the U.S. could face. And yet the Russian jets are being treated almost as a curiosity, while the United States and China “jockey for dominance” in the South China Sea and “are headed for a dangerous showdown,” according to David Ignatius of The Washington Post. I have written at length about the exaggerated myth that this type of interaction between ships or aircraft can lead to a miscalculation that escalates into a clash; history does not bear out the claim. What the Cold War taught, and these latest incidents between the United States and Russia demonstrate, is that when competing navies engage in aggressive posturing and harassment they do not threaten an undesired escalation or the wider relationship; they are merely a reflection of that relationship. Indeed, what is significant about hundreds of serious incidents that occurred between the U.S. and Soviet navies during the Cold War, to include harassment, buzzing, games of ‘chicken’, and even intentional collisions, is not that they happened, but that they never resulted in fire being exchanged or plunged the two countries into nuclear apocalypse. Concern about the possibility of aggressive harassment or acrobatics causing an accident leading to injury or death is certainly legitimate, as shown by the tragic 2001 collision between a U.S. EP-3 and Chinese fighter over the South China Sea that left the Chinese pilot dead. But the Donald Cook did not take any overt defensive measures during this recent event, and the dramatic video of the incident shows that the crew was vigilant, but more out of concern for safety than alarm at possibly being attacked. Thankfully, there has been as little over-reaction in the press as there was on the Donald Cook. EUCOM’s release said the incident was being addressed with Russia through “Navy channels.” The principal mechanism for this is the Cold War-era Agreement Between the U.S.A. and the U.S.S.R. on the Prevention of Incidents On and Over the High Seas (INCSEA) that created both rules of behavior and a forum to address activities and incidents like jets buzzing a warship. But those agreements and treaties didn’t actually reduce dangerous behavior, just perhaps the tension surrounding it. Datasets from the Cold War show that there were about as many serious incidents between the U.S. and Soviet navies in the 20 years after the 1972 INCSEA agreement was signed as occurred in the 20 years before it. What the agreements really signaled was that both the U.S. and U.S.S.R. would likely continue to engage in dangerous behavior when there was a political point to be scored, but each with the confidence that the other was not trying to start a war in the process. 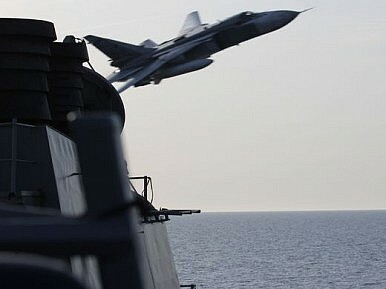 Article IV of INCSEA, which remains in force with the Russian Federation today, requires that “Commanders of aircraft… shall use the greatest caution and prudence in approaching aircraft and ships of the other…in particular, ships engaged in launching or landing aircraft, and in the interest of mutual safety shall not permit: simulated attacks…against aircraft and ships, or performance of various aerobatics over ships.” The Russian pilots over the Donald Cook violated every one of these clauses, but like generations of pilots before them, intended nothing nefarious or hostile, something reciprocally understood by the Donald Cook. The United States and China have concluded a similar memorandum of understanding to govern interactions between their ships and aircraft, though it should be noted that everywhere the U.S.-Russian agreement uses the binding term “shall,” the U.S.-Chinese agreement uses the more voluntary “should.” For nearly 70 years now, the U.S. and Russian navies have operated around one another, sometimes irresponsibly and dangerously (occasionally with tragic results), but never with the intent for anyone to get hurt or of starting a conflict by “accident” or “miscalculation.” We should remember this history and not exaggerate the risks of confrontation when assessing even potentially serious interactions that may transpire between the U.S. and Chinese navies in the years to come. China Signaling it May Finally 'Militarize' the South China Sea OfficiallyLeveraging US Military Power in South China SeaEast China Sea: 2 Chinese Fighters Conduct 'Unsafe' Intercept of US EP-3 Surveillance AircraftTop US Navy Officer Visits US Aircraft Carrier in South China Sea The US Cancelled a Scheduled FONOP in the South China Sea. What Now?